As part of the two-day monitoring and evaluation exercise, the Bio-Innovate Program Management Team, the TAC representative, and consortium project 2 partners made a field visit to Musanze Research Centre in Rwanda on 2 June 2012. The field visit was organized by Mr Senkesha Nitzo from the Rwanda Agricultural Board (RAB), a project consortium 2 implementing partner on ‘Enhancing food security through improved seed systems of appropriate varieties of cassava, potato and sweet potato resilient to climate change in eastern Africa’. 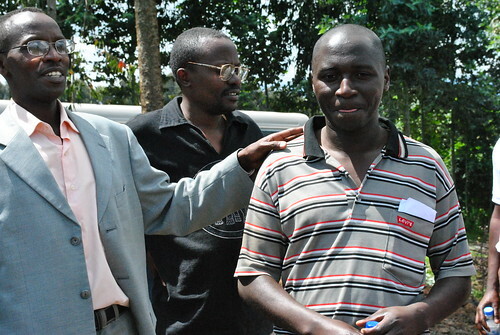 The visit would demonstrate RAB’s progress in creating a sustainable potato seed delivery system for farmers in Rwanda. “Carry something warm, Musanze can be very cold,” Mr Senkesha Ntizo, project consortium 2 partner from RAB advised the group the morning of the third day of the review meeting in Kigali, Rwanda. The group was on its way to Musanze District, 100km from Kigali where RAB was undertaking its project activities. At 8.30am on 2 June 2012, the tour bus departed from Hotel Beausejour in Kigali. The three-hour journey to Musanze meandered through Rwanda’s countryside with farmers busy tilling their land. The team arrived at the RAB facilities at 11.30am upon which Mr Ntizo welcomed the group and proceeded to give a tour of the facilities, which comprised of two laboratories, screen houses, an aeroponics facility, and a field trial station at Kinigi. The two laboratories were an in-vitro tissue culture and a pathology lab. “In this tissue lab, we are generating potato varieties using varieties resistant to extreme weather stresses like drought and low temperatures.” Mr Ntizo said. The presence of a microbiological safety cabinet, high-powered centrifuges, a cold storage facility among other expensive pieces of equipment was evidence of the kind of sophisticated research work RAB was undertaking. 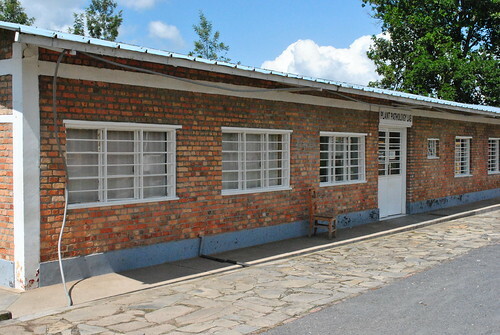 The plant pathology laboratory at Rwanda Agricultural Board (RAB) facility in Musanze District (photo credit: Bio-innovate-ILRI/Albert Mwangi). Afterward the group toured the plant pathology lab where potato tubers from the aeroponics unit and the field trials are screened and analysed for diseases. Ntizo took the group to the aeroponics unit (a screen house for growing plants by pulse-misting nutrients in vapor form on to the developing roots without the use of soil). According to Ntizo, this facility produces potato minitubers from the plantlets that are then transferred to the field for trials. The facility has a capacity to support 2000 potato plantlets in a planting cycle. The aeroponics unit is used to produce potato minitubers to be evaluated in field trials and later distributed to farmers as potato seed. It is currently producing on average 46 potato seeds per plant in a planting cycle. Due to the high demand for potato seeds, RAB is constructing a bigger aeroponics unit that can handle 20,000 potato plantlets with the support received from USAID through CIP and the Rwandan Government. RAB harvests potato minitubers, and takes them to Kinigi station, which is 13km away from Musanze for seed multiplication and/or field trials. The group understood the need for warm clothes when they arrived at Kinigi station, which is 2200m above sea level. 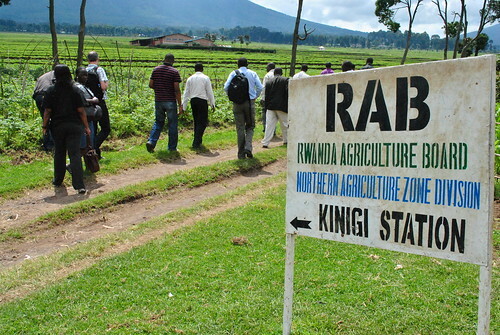 RAB has two other field trial stations: Rutagara (1600m), which is 5km West of Kigali and Bugarama (950m) in Rusizi District. These stations are used for farmer demonstrations in showcasing performance of different crop varieties especially potato and good agronomy practices. In addition, RAB carries out seed multiplication for distribution to farmers, and monitoring different potato varieties for viruses and bacteria. Mr. Ntizo added that RAB was in the process of evaluating sweet potato varieties developed in their labs, which can grow at high altitudes. Sweet potato varieties currently available do not perform well in high altitude areas. Kinigi field station in Musanze District (photo credit: Bio-Innovate-ILRI/Albert Mwangi). On the journey back to Musanze, the group visited Emmanuel Musabyimana, a local farmer who with the support of Bio-Innovate is building an improvised conventional screen house to multiply seeds for other farmers. RAB is offering him technical support in the construction and management of the screen house and will also provide seeds for multiplication. Emmanuel’s screen house will also serve as a demonstration site for local farmers. Karegeya Appolinaire, another local farmer will also be part of this initiative. The two farmers are part of a wider plan to have more farmers with large tracts of land participate in seed multiplication. This is envisaged to create a sustainable seed delivery system for farmers in Rwanda and the region in general. Senkesha Ntizo (left) introduces Emmanuel Musabyimana, a farmer working with RAB to grow potato seedlings for distribution to local farmers (photo credit: Bio-Innovate-ILRI/Albert Mwangi). The tour ended with Seyoum Leta, Bio-Innovate’s Program Manager thanking RAB and other project partners for the commendable progress. He noted that in the absence of field trips it was difficult to grasp the level of progress made by the project consortium. “I am confident that if the project consortium can streamline its financial management systems with the support of the PMO, you will be ready for external evaluation scheduled to be conducted in early 2013.” Seyoum observed. Other stakeholders who complement Bio-Innovate support for RAB are the Rwandan Government who provide salaries for staff, laboratory supplies, and chemicals; the Belgium Technical Cooperation through its Strategic Plan for Agricultural Transformation (SPAT II) program supports laboratory operations, seed multiplication activities and Farmer Field Schools (FFS) initiatives while the International Potato Center (CIP) using United States Agency for International Development (USAID) resources have constructed RAB’s aeroponics units and supported research activities on potato. Project 6 makes strides in diversification and commercialization of sorghum and millet value added products.